Munster returned to the Guinness PRO14 Conference A summit ahead of Glasgow Warriors as they beat the Dragons 8-7 in a low-key clash at Rodney Parade. The Dragons led 7-3 at half-time thanks to a try from tighthead prop Lloyd Fairbrother, which Josh Lewis converted, against a Bill Johnston penalty for Munster. But an unconverted try by lock Jean Kleyn, the only score of the second period, gave the Irish visitors the victory. The persistent rain thwarted running rugby as both teams chose a kicking game, some decent, some aimless, through the first half. And with plenty of handling errors, it was not a pretty sight as Munster looked to go back above Glasgow Warriors, who won 9-3 on Friday against the Ospreys. The Dragons had the better of it in terms of territory before the break as Munster, with 13 changes from the team which beat Exeter 9-7 in the Champions Cup last weekend and 11 of those away with the Irish Six Nations squad, lacked coherence. As a result, the Welsh region went ahead on 14 minutes when Fairbrother drove over from a metre after a series of rucks on the Munster line. Lewis converted and the home side could have had another when centre Tyler Morgan went through the Munster midfield, fed wing Jared Rosser only for the flyer to be brought down 10 metres short. The Irishmen began to click as half-time approached. Johnston booted a 26-metre penalty to reduce the arrears and with scrum-half Alby Mathewson in the thick of it, referee Ben Blain went to the video ref when lock Billy Holland drove over but did not award Munster the try. Lewis tried to extend the Dragons' lead early in the second period with a 30-metre drop goal which barely got off the ground. Munster pressurised the Dragons for an age just metres from the home line just before the hour mark as the Welshmen gave away penalty after penalty and saw lock Matthew Screech sin-binned for pulling down a ruck. But the Irish region could not make the most of their advantage, Kleyn, one of the two survivors from last week's European game, dropping the ball in the process of scoring. However, the second row made up for his error on 64 minutes by driving over from a metre. It went unconverted as Munster established a one-point lead. 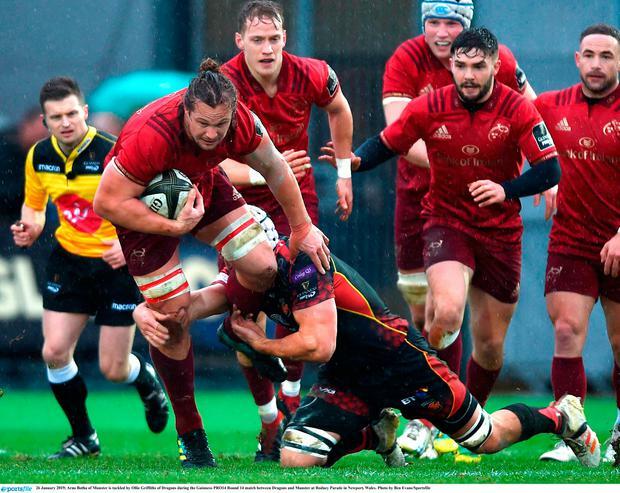 The awful standard continued right to the final whistle as Munster took their 10th league win from 14 games, while it was a 10th PRO14 reverse for the Dragons.